Sun damage is a result of DNA damage to skin cells. DNA, the brain of the cell, absorbs Ultraviolet B light and this damages the genetic code. Damaged genes are incapable of maintaining normal cell function. The visible result is sun damage. The four categories of sun damage are colour change, texture change, loss of tightness and skin cancer. Colour changes are either red, brown or white. Brown blotches are caused by an irregular increase in a pigment called Melanin. Melanin is normally spread evenly through the epidermis. DNA damage to melanocytes, the cells that produce melanin, causes irregular production of the melanin pigment. A decrease in melanin production leads to lighter or even white spots. An increase in melanin production results in brown, dark brown or even black spots. 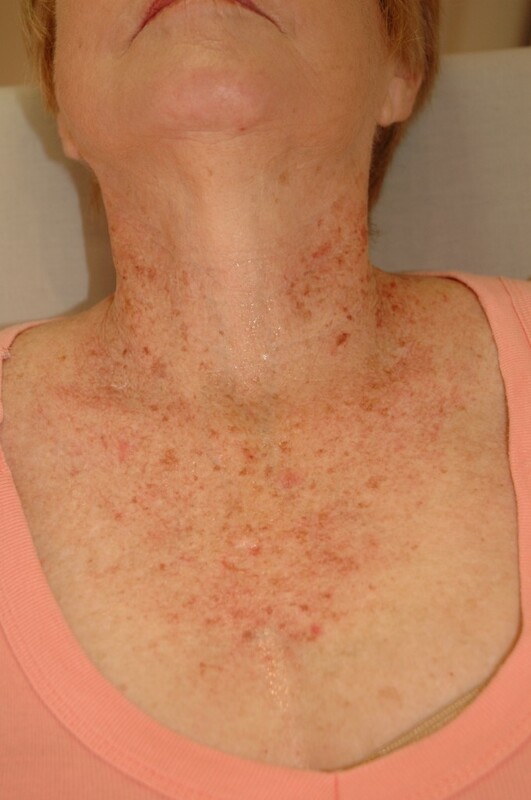 Red blotches are a result of more prominent blood vessels. Blood vessels can increase in number and in size due to sun damage. An increase in the number of blood vessels is a result of inflammation. When you get a sun burn and the skin goes red and sore, it is due to inflammation. Inflammation is the bodies attempt to heal itself and in the process new blood vessels form by a process called neovascularisation. Damage to the connective tissue, collagen fibres, elastic fibres and fibroblasts around blood vessels weakens the support structure of blood vessels and causes blood vessel to dilate and increase in size. The second category of sun damage, a rougher skin texture, is the result of sun damage to the connective tissue in the dermis, sun induced enlargement in oil glands, enlargement of pores and dehydration of the skin. Loss of tightness of the skin is also due to ultraviolet light (especially ultraviolet A) damage to elastic and collagen fibres and DNA damage to fibroblast cells that make collagen and elastic fibres. Eventually this leads to skin sagging. The fourth category of sun damage is skin cancer. Sun induced skin cancer is a result of progressive and cumulative damage to the DNA of the epidermal cells. There are two main cell types in the epidermis. Damage to the DNA of melanocytes, the pigment forming cells, leads to Melanoma. Melanoma is a highly aggressive form of cancer, with a tendency to spread (metastasize) throughout the body early. Damage to the DNA of keratinocytes, the cells that make up the bulk of the epidermis, causes the most common skin cancer in humans, Solar Keratosis. Eventually more aggressive skin cancers like Squamous cell carcinoma and Basal cell carcinoma develops. I am 38 years old female, wears sun block and try to avoid the sun as much as possible. Yet, it seems like my brown spots as well as white spots (I hate those!) are increasing. Can these be lasered off or any other method that can remove it completely? I also want to have nice looking arms and wear summer tops with confidence. Dear Lucinda. Certain brown spots can be lasered, but not white spots. If you can, rather come and show me. Dear T. If it is only freckles and not another type of sun damage, then laser should work. Full face laser is around R2000. 1-3 Sessions might be required. I have darkness in certain area of my face and looks very ugly, cause of sun damage and have it more than ±3 years now. I went to alot of doctors for help, but only got a certain cream to put on face 2 times a day. Is there something i can use or something that can be done to lightened my face? Dear Charlene. There are many treatment options for sun induced hyperpigmentation. Sunblock, certain skin lightening creams and certain lasers is the normal sequence of treatments to start with. I have hyper pigmentation on my forehead and on the side of my face, I have tried various treatments from Nimue over the last 4 years ( TCA’s, Bio Lacto peels ) without seeing any results. It looks really ugly and I would like to know what other treatments I can do that will show results. Dear Romeo. I think you will most likely require some form of prescription medication, depending on your normal skin colour. Come and show me, if you can. My cat scratched my arm and hands and I used to scratch these sores. There is now sun damage and the skin in those areas have turned very dark. It looks really ugly and I would like to know if they can be removed or at least lightened? Dear Lisa. Certain lasers and certain creams can be used to improve pigmentation…..assuming pigmentation is the active problem.